in a single integrated console. Electric power generation involves enormous investment in fixed equipment operating at conditions requiring precision control of many variables. The availability of accurate real-time generator monitoring information can be the key element in maintaining precision equipment in good operating condition and avoiding downtime caused by failure. E/One Utility Systems designs and manufactures a generator monitoring system combining multiple functions into a consolidated unit, fully engineered and coordinated for each application. Each customer can choose to incorporate functions as needed for their installation. This flexible and cost efficient approach to gas monitoring and control systems for electric power generators capitalizes on the use of pre-engineered modules to reduce installation and on-site engineering burden. More information is provided in the document below. Share your power generator monitoring and control challenges with product specialists and work together to develop effective solutions. 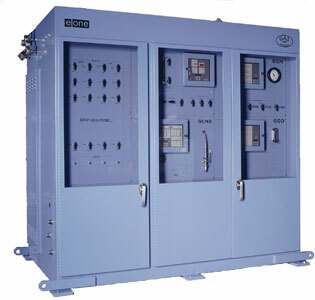 E/One Gas Station Integrates Multiple Generator Equipment Monitoring Functions from Classic Controls, Inc.